(Nov. 28, 2012 – Kuala Lumpur, KL) South Korean singer PSY, a.k.a Park Jae-sang, grabbing worldwide attention with his contagious hit song“Gangnam Style”. As of November 25, 2012, the music video has more than 810 million on YouTube, and honored the all-time Most Viewed Video after surpassing Justin Bieber’s impressive single “Baby”. “Gangnam Style” which crowned its first Guinness World Record – the Most Liked video in YouTube history – by receiving over 1.57 million “likes” on September, 2012. Moreover, the song is also the highest charted K-Pop song on Billboard history. Riding this “Gangnam Style” wave, Universal Music Malaysia is carrying out a ringback tone contest which is believed that will attract the attention from all the “Gangnam Style” and K-Pop lovers. 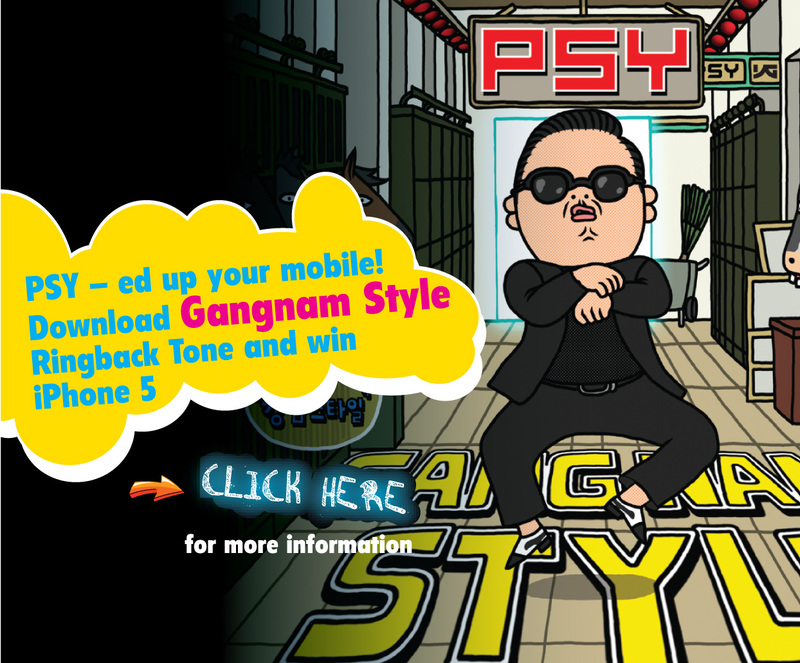 “Download Gangnam Style & Win iPhone 5 Now” is a contest organized by Universal Music Malaysia. To appreciate all the incredible support on “Gangnam Style”, Universal Music Malaysia is giving away six iPhone 5 for fans who subscribed and keep the ringback tone from now to 15thDecember 2012. “The contest initiated not only to ride on the over whelming global phenomenon but the high level of acceptance locally which is proven from the massive airplay PSY is enjoying across most radio stations. Undoubtedly, ‘Gangnam Style’ is famous for its catchy beats and memorable lines, and of course the dance moves! These are perfect for making it as a ringback tone,” says Mr Loan Cheong, the Managing Director of Universal Music Malaysia. For more information regarding this contest, can log on to the official website of Universal Music Malaysia (www.universalmusic.com.my). The respective promotional video has also uploaded to the official YouTube account of Universal Music Malaysia (http://www.youtube.com/watch?v=_YF-_rutqe8&feature=youtu.be). The CD single of PSY’s “Gangnam Style” is currently available at any local music store in Malaysia, selling at RM 9.90 which includes the song and music video of “Gangnam Style”. This is also available on iTunes (http://umusic.ly/xeg8nm). « 2AM: The Way of Love, Captivated Malaysia with More Than Just a Ballad performance. I am not certain the place you’re getting your info, however good topic. I must spend some time finding out more or figuring out more. Thanks for excellent information I used to be looking for this information for my mission.